We’ve been profiling some of the companies and brands that are making a good impression on Pinterest. Now we’re turning our eye to the standout performers on Facebook Timeline. Many businesses have been working with Facebook for years, but the changes related to Timeline have made it more challenging for companies in some respects. Interactions with fans are different, and there’s no guarantee that your status updates will be widely seen. So, how should companies alter their strategies on the platform? Spotify is one of the businesses that has adapted quickly to the Timeline layout. With a unique take on the material you can present through the social network, Spotify provides some excellent lessons for those looking to improve their presence on Facebook. Spotify has one of the most inventive uses of the “Milestones” feature on Timeline. Rather than simply marking the dates when the company was founded, or joined Facebook, Spotify has used Milestones to mark important dates in the history of music. The births of musical notables from Duke Ellington to Kurt Cobain, the releases of famous singles, and the advances in technology for listening or recording music are all featured on the Page. Landmark album releases are also highlighted. 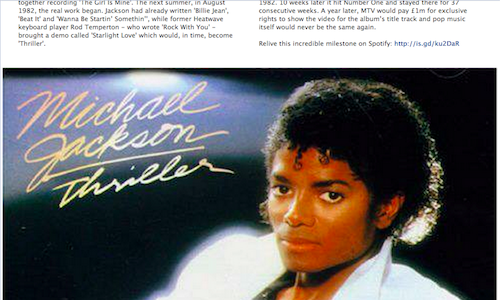 For instance, work on Michael Jackson’s Thriller began in 1981, and the Milestone post includes historical notes about the writing and production of the famous album. At the end of the description, there is a link to listen to the album on Spotify. This strategy links together the service and the greater music industry in a creative way, and means fans are likely to spend more time browsing through the Spotify Page to find interesting music history factoids. Spotify has several recurring updates on Facebook, such as “New Music Tuesday.” This allows it to cover many genres of music available through the platform, thus connecting with a wider range of fans. The company also frequently runs contests, giveaways, and informal polls about music-related topics to keep follower interest and engagement high. The other content angle where Spotify excels is tie-ins with celebrities. Famous musicians will create playlists for the company that it promotes on Facebook. Artists from Smashing Pumpkins to Damian Marley have created Spotify sets in the past month. It’s a mutually beneficial arrangement, promoting both the musicians and the brand. Developing partnerships of this nature can translate to a broader reach for your brand. After all, if you name-drop a partner in a Facebook post, they’ll almost certainly do the same for you. 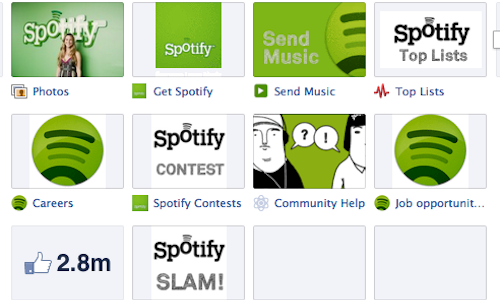 Spotify has made its branding and product easily visible throughout its Facebook Page. The logo and company name are featured prominently in its photos and videos. 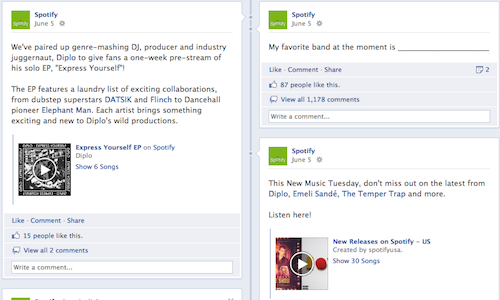 This consistency helps reinforce Spotify’s presence on Facebook — and on other social media networks, as well. The company has also made smart choices in the apps it features on its menu bar. Of the four visible apps, three are directly related to the platform. Fans of the Page can directly download the Spotify software or apps, view the most popular songs, or send select songs to friends. The other apps on its Facebook Page include all the Spotify contests, community help, job listings, and other company-developed platforms. These features help orient fans to the available content and information about the company. This is helpful since Spotify is a prolific poster, and some information could otherwise get lost in the shuffle. Do you know of a company that’s a rock star on Facebook Timeline? Let us know in the comments!